For each disk space analysis operation, DiskSavvy Server saves an individual disk space analysis report in the built-in reports database. 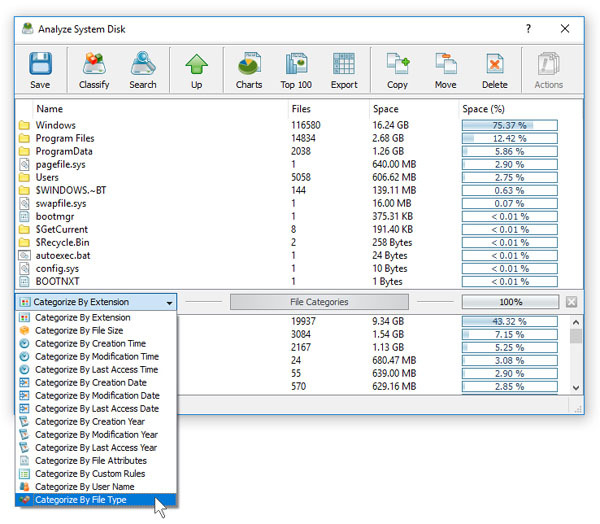 In order to open the last report for a disk space analysis command, click on the required disk space analysis command item in the commands view. In order to browse all previously saved disk space analysis reports, press the 'Reports' button located on the main toolbar. 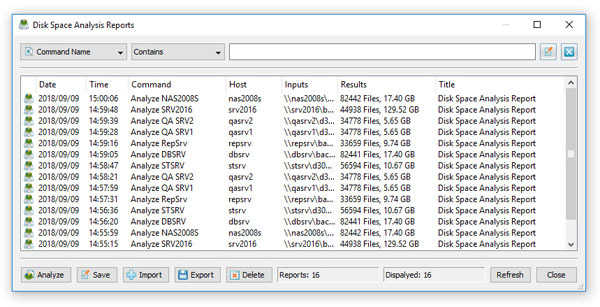 DiskSavvy Server allows one to filter disk space analysis reports by the command name, host name, date and input directories. In order to filter disk space analysis reports, select an appropriate filter located on the top side of the reports dialog and then enter a filter value. When a report filter is active, DiskSavvy Server displays the number of filtered reports on the reports dialog and shows reports matching the selected report filter in the reports view. In order to reset the currently selected report filter, press the 'Reset Filter' button located in the top-right corner of the reports dialog.